GPS. When you ask yourself “where am I?”, you are there. The beauty of wandering off the path is that you discover beauty. Yesterday I picked up my camera, left the desert path I know so well, and wandered into a rugged showroom of nature’s most astounding features. The path always tells me where I’m going, that’s its job. Follow me and I’ll get you there, wherever “there” is. But climbing the pathless hill, walking along the unmarked ridge line was an experience both thrilling and treacherous. I have found that abandoning the familiar path in search of beauty almost always pays off. You find it. Or, it finds you. 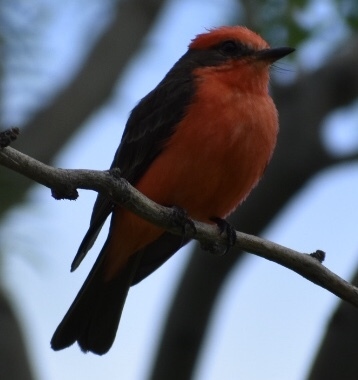 The Vermillion Flycatcher proved my theory yesterday. She dropped out of the sky, sat on the tree limb in several poses, head this way, left profile then right. And, as if on cue, this beautiful creature lifted off, circled once and vanished into the afternoon sunlight. But even the momentary glimpse of the brilliant red and the graceful flight of a small bird is enough to confirm my suspicion. When you look for beauty in the world, you’ll find it. It is there. It is always there. Beautiful picture of this special bird, I have one or two in my neighborhood and always feel that all is right with the world when I see one in the morning. Lovely! Such a nicely written blessing. I remember exactly where I was when I saw my first Vermillion – not too long after arriving in AZ. I have treasured that moment of beauty for many years. Thank you for the reminder of that discovery of this beautiful bird.